Toulon prop Martin Castrogiovanni has been fined and given a suspended ban after he admitted misconduct charges for his rant against Leicester director of rugby Richard Cockerill. Castrogiovanni, 33, made the comments to reporters after Toulon's European Champions Cup loss at Welford Road on 7 December. He has been handed a four-game ban, suspended until April 2016. The Italy forward must also make a 10,000 Euro donation to charity. However, European Professional Club Rugby cleared the prop of claims he called his former club "amateurish". While Castrogiovanni escaped an instant suspension, his team-mate Delon Armitage has been banned for 12 weeks for using foul and abusive language towards Leicester Tigers fans after the same game. 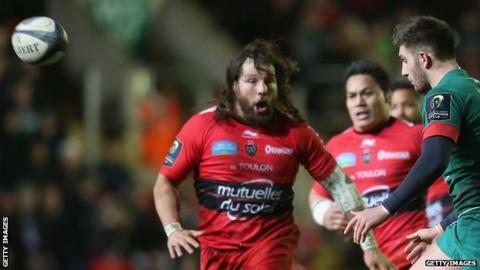 Castrogiovanni made his comments to reporters after Toulon's 25-21 defeat by Leicester. The Independent Disciplinary Committee said in a statement that Castrogiovanni was guilty of misconduct and that the comments made were "utterly indefensible". "Given the extraordinary nature of his outburst, Castrogiovanni is perhaps fortunate to only receive a suspended ban, especially as Cockerill missed nine matches in 2013 for using abusive language towards an official. Castro will hope his reputation as a Tigers legend has not been damaged. The committee noted his "genuine remorse" and he spoke on the phone with Cockerill last week to clear the air." However, committee chairman Antony Davies accepted that Castrogiovanni's comments regarding Leicester being "amateur" were made in an ironic and questioning manner, and therefore did not constitute criticism. A statement on behalf of Castrogiovanni said: "Martin is relieved that the panel accepted his explanation as to his remarks, since he has always had and continues to have a strong love for the club. "He was genuinely remorseful for his comments after the match and this is reflected in the panel's sanctioning."